A simple welcome mat with your initials at your front stoop can say that you are proud of your home and want to put your name on it for all guests to see. You are putting a stamp of approval and ownership on your doorstep. Conversely there are hundreds of simple mats that combine form with function and help to accent and beautify the front porch of any home. These types can come in many shapes, sizes and styles so a homeowner can find the one that best suits their needs. Now sticking with what a welcome mat says about you and your home but switching gears slightly, what if you changed out that same mat to a Humorous Welcome Mat? In this case you are telling anyone that comes to your door that you enjoy a good sense of humor and that you want anyone entering your home to be in good spirits. A good humorous welcome mat can also act as an ice breaker for those first time get together with new friends. Have a dog or a cat, put out a funny animal welcome mat that will get your guests talking as the come into your home, asking you about your pets and thus easily breaking the ice. Now we follow that up with the ever popular Sports Welcome Mats. These types of mats introduce your home as the home of a sports connoisseur, who might have a passion for a particular sports team. They want everyone who visits their home to know where their loyalties lay and they will defend their team vigorously. This can be especially important in places where one team is clearly favored over another and if you enjoy another team more than the local favorite it can be a good way to let your guests know this as they come into your home. Then there are the always popular print image Seasonal and Holiday Welcome Mats. Seasonal and Holiday Welcome Mats are some of the most universal mats available as almost everyone has used them or seen them at one time or another. What better way to bring good cheer to visitors by putting out a mat that reflects the holidays or season. A bright pastel and flowers mat for the spring, a rustic colored leaf print for the fall, or a jolly plump red cheeked Santa Clause for the winter holidays. These types of mats are great for adding a little holiday or seasonal spirit to your homeâ€™s presentation. Lastly some of the over most overlooked mats are your commercial and industrial mats. Although the name tends to scare people away from them and using them in their homes, this is often a grave oversight as they have tremendous potential. Although not likely to be used on the front door step, these types of mats can find wonderful uses in the kitchen, garage or workshop. In many cases they are designed to lessen the strain of standing in one place for extended periods of time or they are designed to keep water and debris from being tracked throughout your house in the winter months. There are even grid modular mats that can be used under home gym equipment. All it takes is a little creativity to find a good use for these types of mats. As the reader can tell there are so many different uses for mats that any mat can be a good addition to a home. All it takes is a little thought and sometimes creativity to find the right use for the mat you want to add to your home. Just remember; think about what you want the mat to say about you or about your home before you put it out. 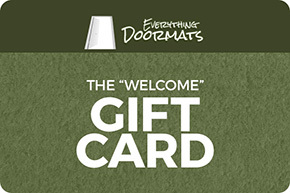 To find all these types of mats and more, visit Everythingdoormats.com your authority in all things related to mats.